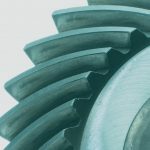 The transmission is one of the key components on through which, thanks to the clever design of all components, the degree of efficiency, wear, and noise emissions can be optimized. This industry has a tailwind; the wind power industry is growing at a rapid pace. The reasons for this are many. 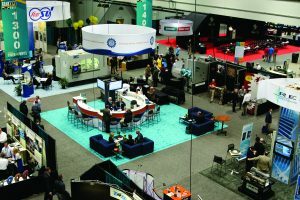 Ambitious climate targets, necessary CO2 emission reductions, and the ongoing debate about atomic energy are ensuring a boom in the industry, thus also a flurry of activity in terms of technological advancement. Modern measurement technology for enhancing efficiency in quality assurance is an important part of this endeavor. 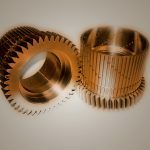 Optimum component quality is a competitive advantage, which enables the wind turbine transmission manufacturers to be at the cutting edge of this technology. 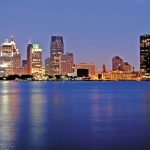 The industry has considerably increased the performance of the wind power plants in recent years – this is apparent to the outside world from the sheer size of the systems. A central priority of all of the companies participating in the development is therefore to enhance the performance density of the individual components in order to avoid having the dimensions and the weight of the nacelles increase to the same extent as the output of the system. Most wind power plants operate with a transmission in order to transfer the relatively small rotation speed of the rotor through several transmission stages to increase the rotational speed suitable for the generator of around 1,500 rpm. To accomplish this, typically several planetary gear stages are arranged, one after the other. 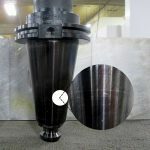 The measurements of the transmissions have also increased along with the high outputs to be transmitted, so that the internal gearings to be used sometimes have a diameter well in excess of 2 meters. The transmission is thus one of the key components on which, thanks to the clever design of all components, not only the degree of efficiency, wear, and noise emissions can be optimized, but also the size and weight of the nacelle can be reduced. It is for this reason that certain components are deliberately omitted, already during the development stages, in order to obtain a transmission that is as compact and lightweight as possible (Figure 1). This is possible by having individual components assume responsibility for various tasks simultaneously which are distributed between several components in conventional designs. 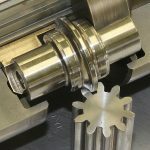 The internal gearing ring of the planet stages, for example, is at the same time a load-bearing part and the outer shell of the transmission – which means that both machine holder and housing can thus be dispensed with. 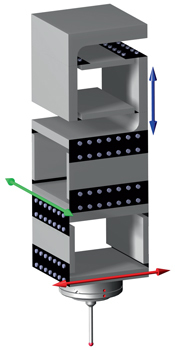 In addition, the first of two transmission stages is integrated directly into the main bearing. 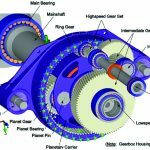 The planetary bearing is located in turn in the planet gear. 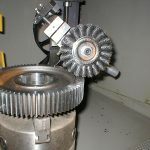 Instead of separate external bearing rings on the planet gears, correspondingly formed bearing surfaces are ground into the gearing component. The rolling elements of the bearing thus run directly in the bore hole of the gearing. 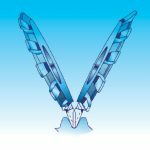 The components not only become more compact as a result, advantages also arise at the time of assembly, sources of errors are reduced, and concentricity precision is enhanced. 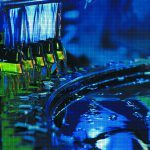 The requirements for the remaining components are considerably increased, however; new production processes become necessary. 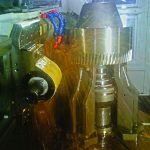 As a result of the fact that the rolling elements of the bearing run in the bore hole of the planet gears, grinding work of bearing quality is required on the bearing surfaces. The geometry of these bearing surfaces is, in the meantime, relatively complex, with very low tolerances. This becomes clear with the example planet gear with integrated bearing surfaces (Figure 2). 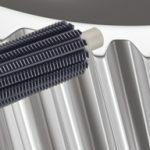 As a result of the changed design, new processes are required not only for the production of these components but also for their quality assurance. 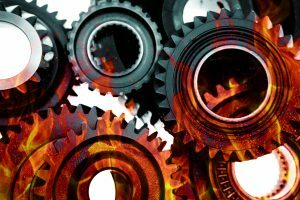 In order to check all of the functions of the component-relevant parameters — now assigned several tasks — measurements of dimension, form, and position must now also be carried out in addition to the complete gearing measurement. The form measurements on the bearing surfaces are thereby particularly challenging and are very demanding of the measuring technology applied. 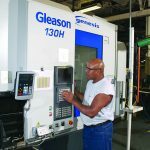 The solution for minimizing the overall cycle time for all measurements, including tool time, is complete measurement designed to run automatically on only one measuring device. 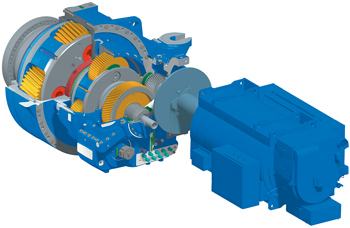 Towards this end, Klingelnberg has specially developed the P 150 W for the requirements of the wind turbine transmission components on the basis of the machines of the P series. 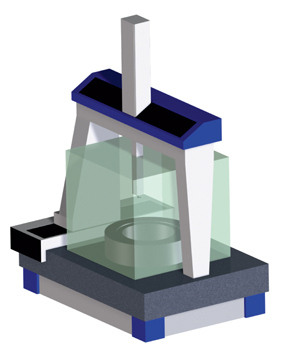 In contrast to the familiar P machines, the new 3-D measurement system is fitted on a perpendicularly aligned boom so that internal bore measuring is possible (Figure 3). 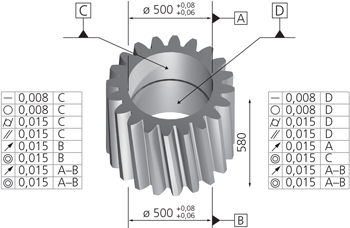 This means that not only external gears but also internal gears can be measured to an equal extent with short probe rods. This arrangement also offers special advantages for form measurements in bores. 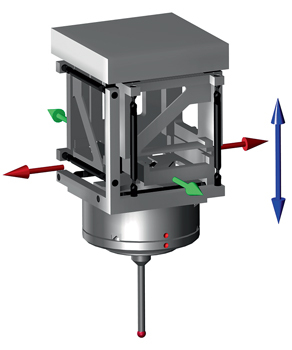 Measurement systems from CMM (coordinate measurement machine) are usually constructed in such a way that the kinematics for the three coordinate directions are physically arranged behind one another. This design with serial kinematics has the decisive disadvantage that the moved mass in the three coordinate directions may differ from one another and, depending on the direction, can even be very large. In order to reduce the construction size, these measurement systems are designed to nest inside one another. This does not influence the disadvantage of serial kinematics, however. 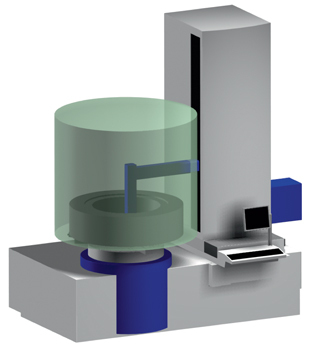 Figure 4 shows this kind of 3-D measurement system, simplified without nesting. 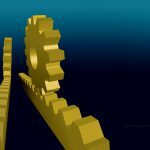 In the case of form measurement, it is well known that special demands are made on the dynamics of the measurement system. 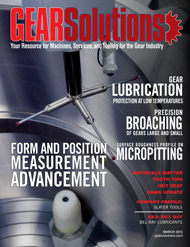 This is also true for gear tooth measurement, which in principle is a combination of form and 3-D measurement. It is for this reason that the Klingelnberg 3-D measurement systems (Figure 5) have, as a general rule, unique patented parallel kinematics with three coordinate directions nested within one another, but arranged next to one another in physical terms. 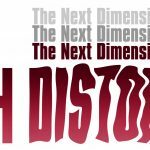 This construction provides decisive advantages; the moved mass is not only identical in all directions, but also and primarily considerably less than the conventionally structured 3-D measurement systems. 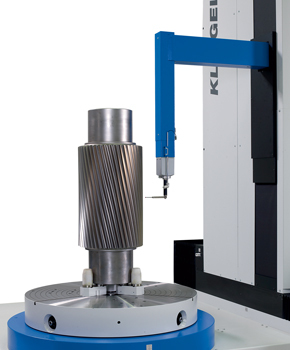 As a result, the measurement systems of the Klingelnberg P series are suitable not only for gearing measurement and general 3-D measurement, but also for other high-resolution form measurement tasks. A further prerequisite for form measurements on axially symmetrical components is the use of a high-precision rotational bearing. 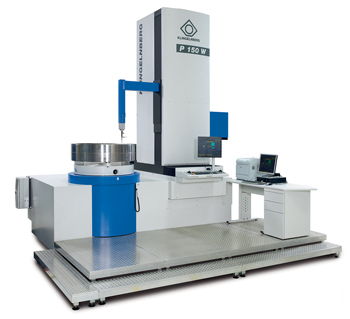 The bearing of the P 150 W, for example, possesses a static strength of 20 tons while at the same time having a concentricity precision which is less than 0.5 micrometers. Both the development and the production and integration of this bearing is a core competency of Klingelnberg. 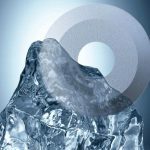 No bearing with this concentricity quality and the static strength of 20 tons is available on the market. 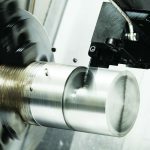 When a comparison is made between the conceptual structure of the P 150 W with that of a conventional CMM (see Table 1), it becomes clear which advantages can arise from the structure of the P 150 W with three linear precision axes and one high-precision axis of rotation. 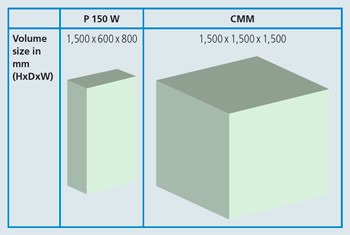 In the case of the P 150 W, the Cartesian measurement volume set up by the three linear axes is deliberately considerably smaller (Figure 6) than is the case with a CMM. As a result, a very high basic precision can be achieved in this measurement volume, which is then additionally improved by a patented compensation procedure which was specially developed for this machine construction. 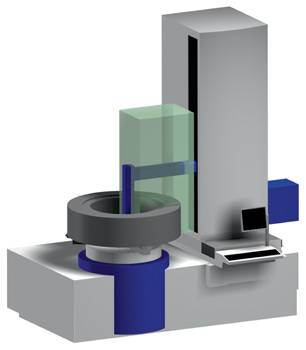 The combination of this measurement volume can thus be mastered perfectly in geometric terms, and the high-precision axis of rotation results as a whole in a considerably larger, cylindrical measurement volume (Figure 7) with a comparably lower measurement uncertainty. In contrast to this, the relatively large measurement volume of a conventionally structured CMM must be compensated for (Figure 8). Due to the laws of physics, this is difficult to master, very complex and must be repeated at certain intervals. 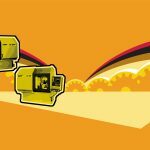 Efficient and modern measurement machines are a decisive part of the dynamics for ongoing and future developments in the wind power industry. They support the companies who contribute to keeping the tailwind blowing – so that climate targets can be achieved, emissions reduced, and an alternative to both nuclear energy and CO2-intensive energies will be strengthened. 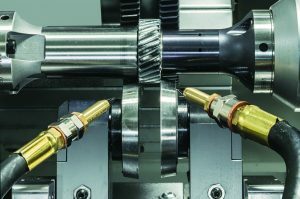 is manager of R&D Measuring Technology for the Klingelnberg group, a world leader in the development, manufacture, and sale of machines for bevel gear and cylindrical gear production, measuring centers for gearing, and axially symmetrical components as well as customized high-precision gear components. Contact him at +49 2192 81-0 or email at g.mies@klingelnberg.com.